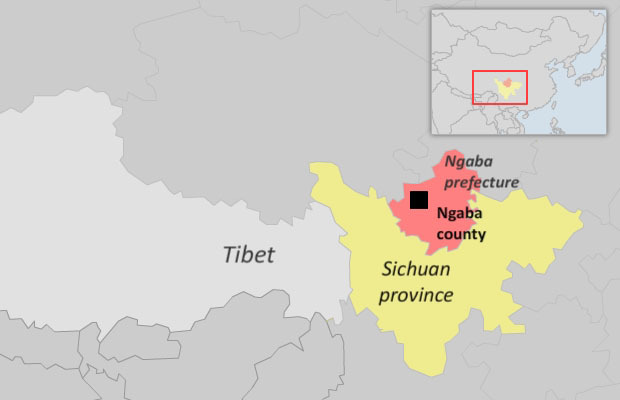 (TibetanReview.net, Jul18, 2016) – Chinese police were reported to have been seen taking away a young Tibetan woman after she staged a lone protest march in Ngaba (Chinese: Aba) County of Sichuan Province on Jul 14. The as yet unidentified woman, who wore a white dress and appeared to be in her 20s, was held at around 4:00 pm as she marched down a street named by local Tibetans as “Heroes Road” in the county seat, reported the Tibetan Service of Radio Free Asia (Washington) Jul 16, citing a local source. The woman was reported to be holding up a portrait of Tibet’s exiled spiritual leader, the Dalai Lama, seen by China as the symbol of Tibetan resistance to Chinese rule. “Heroes Road” has been a site of many Tibetan protests, including self-immolations, and the Chinese police posted there were reported to have swiftly clamped down on the Tibetan woman and whisked her away. The protest was reported to have sparked a brief flurry of comments online from area residents, with some saying the woman belonged to the county’s Churle Karma Village. The online discussion apparently over the China-based mobile WeChat forum was swiftly blocked by the authorities who closely monitors it.